would you gamble it all?" UK's Barclays stockbroker Andrew Barrington-Smyth’s business deal with Malaysian born casino tycoon Robert Foong is in jeopardy when local Chinese chef David Tan is found dead, murdered with his own meat cleaver in the sleepy seaside village of Cabarita Beach, Australia. Detective Jack Creed has his investigation skills tested to the max trying to unravel a mystical east west collaboration involving money laundering, shady property deals and the reputation of the British Barclays Stockbroking financial institution. Is blackmail involved? Are Macau’s triads collecting on a debt? Then two more murders occur. Jack Creed needs to solve this fast before more people are killed. But he’s hit a ‘Chinese wall’ – nobody is talking! 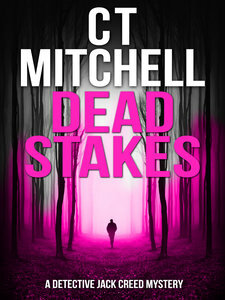 From the author of mystery novels, Dead Boss, Australian crime author C T Mitchell, crafts another masterful web of twists and turns that tests Jack Creed's metal in this automatic page turning thriller, Dead Stakes. Strap yourself in for another wild ride Down Under.